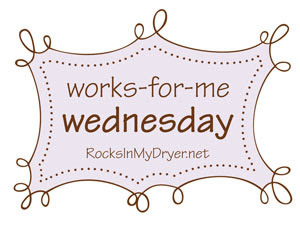 Rocks in My Dryer is hosting Works For Me Wednesday, Backwards Edition. I like to do one big weekly grocery shopping trip on the weekend. I like to keep fresh fruits and vegetables around for cooking and eating raw. How do you select/handle/store your produce to keep it fresh all week? It always seems to me that much of the produce will be soft or wilted or mushy by mid-week. I tend to front load my weekly meal plan with the fresh items, but miss them at the end of the week. Leave your solution in the comments. For other dilemmas and suggestions, check out Rocks In My Dryer: Works for Me: Backwards Edition. Don't wash your greens when you get home. Wrap them in a paper towel and put in Walmart bag. Stores for 2 weeks or so. Hope that helps.. They might do the trick for you. Plan the second part of your week to use fruits and vegetables that store better - cabbage, apples, oranges, carrots, celery, iceburg lettuce, cucumbers, bananas (buy some green). Also don't discount frozen vegetables. They are frozen at the peak of freshness, and without any added salt, so they are very healthy. Use the shorter shelf live produce in the beginning of your week - lettuce, berries, etc. Invest in the Debbie Meyer Green Bags. I bought mine at Target. They really do work and are worth the $$. You get 10 reusable bags for $10.